Liquitex Professional Grade Artist Colours, offer the most permanent, brilliant, lightfast and versatile airbrush colour available. All colours are low to no odour, easy to thin and clean up with water. They are non-yellowing, water resistant when dry, fully pigmented, flexible and non-toxic. Same pigment load as in Heavy Body Artist Colour. Fluid consistency mixes easily with Airbrush Medium to make airbrush colours. Small amount of Airbrush Medium necessary for proper consistency means intense colour. Pre-filtered, no straining necessary after adding Airbrush Medium. Packaged in convenient flip-cap, squeeze containers. Heavy body paint takes longer to thin and requires greater amount of Airbrush Medium to reach airbrush consistency. This yields less intense airbrush colour and straining may be necessary. 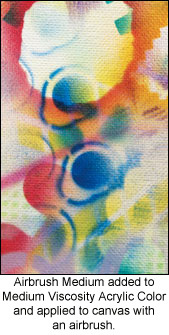 Liquitex Soft Body Acrylic Colours can easily be thinned to flow properly through an airbrush. The proper thinning procedure is determined by the type of surface to be airbrushed and by durability desired for the final paint film. Hardwoods, paper, fabric, plaster, Liquitex Modeling Paste, bare wood and primed canvas. Thin paint with water or Flow-Aid Water (FAW). To create FAW, mix 1 part Flow-Aid to 20 parts distilled water. Use this mixture instead of water and follow directions for "Thinning with Water", below. Fabric: Wash prior to airbrushing to remove sizing. Colours must permeate the cloth and be seen as a ghost image on the reverse side to be permanent. After 3 days cure time, the fabric can be machine-washed or dry cleaned. Resulting colours are permanent. For more information, select "Fabric Painting" in the search area. Surfaces absorb paint differently. Spray a test piece prior to spraying actual surface. First add 50% water or FAW to the paint and mix thoroughly. Add more water if necessary to produce the desired effect. Colour may be thinned up to 80% with water. Some colours may require more or less water due to individual pigment characteristics. Adding water reduces pigment concentration and colour strength. Strain to insure proper flow through airbrush. After several airbrush layers it is possible that the surface will no longer be absorbent. When this occurs, subsequent airbrush layers must follow directions for Non-Absorbent Surfaces. To increase absorption on absorbent surfaces, paint flow through airbrush and reduce paint buildup and tip clogging use Flow-Aid Water (FAW) instead of water. Mix 1 part Airbrush Medium into 1 part Soft Body Concentrated Artist Colour. Mix thoroughly, adding more Airbrush Medium as needed. The proper consistency for acrylic paint is that of light cream. As more Airbrush Medium is added, the intensity of colour will be decreased and the transparency increased. If mixture is too thick to flow through airbrush, either increase air pressure or add water to thin airbrush paint mixture. Do not exceed 1 part Airbrush Medium to 1 part water. The proper viscosity will depend on the air pressure supplied, type of airbrush and proximity to the working surface. As the paint is thinned, air pressure can be lowered and the airbrush held closer to the working surface for greater detail. As the air pressure is increased the airbrush is held further from the working surface. Thin paint with Airbrush Medium, Liquitex Fluid Mediums & water or Liquitex Fluid Mediums and FAW. Over thinning with water only may cause poor adhesion, cracking, flaking or peeling. Abrade surface for increased adhesion. Masks cover and protect areas not to be painted. Stencils and Friskets are two types of masks. Masking paper can be taped over larger areas. A thin sheet of material in which a shape or pattern is cut, through which paint can be applied to the surface below. Frisket films are usually 3-mil clear vinyl with a low tack adhesive on one side, that protect covered areas from overspray. 1. If an area has been painted, allow to completely dry before applying frisket. 2. Burnish frisket to make sure it's flat, with no air bubbles. 3. To improve adhesion of frisket film to canvas, use a fine weave canvas and apply 1-2 coats of Gloss Medium & Varnish over area that is to be covered. 4. Using a sharp razor knife and light pressure, carefully cut frisket to desired shape. Remove unwanted frisket and apply next colour. 5. Do not allow frisket or tape to remain on the surface for periods longer than a day. To achieve straight lines or attach masking materials use Drafting or ScotchTM tape. It has a low adhesive tack, which will not disturb the dried acrylic paint it is applied over. Follow directions for frisket (above), substituting tape for frisket. 1. Allow sprayed area to fully dry. 2. Use a clean, soft brush or spray application and carefully coat area with Liquitex Gloss Medium & Varnish. Allow to dry. 3. Contine airbrush application over painting surface as needed. Repeat as necessary. When spraying, use an effective dust or particle mask, approved by NIOSH. Airbrush in enclosed area as spray particles are airborne and will travel widely. Airbrush enclosure should have adequate ventilation, with vent for incoming air and fan exhaust. Read paint label. Cadmium pigments are toxic in mist (spray) and are considered to be potentially cancer causing if inhaled. They should be avoided in spray technique. Liquitex Cadmium Hues are non-toxic in mist and can be used in place of Cadmium colours for spray applications. Always keep the work areas clean of airbrush overspray. Do not eat or smoke in the studio. Every colour has a specific opacity, hue, value and chroma. These ratings are important in airbrush technique, since colour blends are optically created. In traditional painting, colours are physically mixed on a palette. All Liquitex Acrylic colours are labelled on every container for Opacity, Hue, Value, Chroma, Lightfastness and Pigment Names as well as safety information. Refer to Label Information. Because Liquitex Acrylics are water-soluble, they can be easily cleaned from the airbrush while wet. Do not allow acrylic paint or mediums to dry in the airbrush. Back flush clean water through the airbrush, periodically. You may get paint buildup on the tip of the airbrush needle and in the spray cap. Remove buildup using your fingernail, occasionally removing the needle for a more thorough cleaning. While taking short breaks, airbrushes can be stored in a container of water with tip submerged to keep the paint from drying. Do not immerse the entire airbrush in water. Use water, an ammonia based window cleaner or airbrush cleaner to spray through the airbrush for back flush clean by placing the finger over the front of the brush (depending on type of airbrush). Spray cleaner through the airbrush into a paper towel. Allow some cleaner to remain in the airbrush for about 15 minutes to loosen any stubborn deposits. Follow this by spraying water through the brush until clean. Remove acrylic that has dried onto the outside of the airbrush with denatured alcohol. Do not soak plastic washers, seals or handles in alcohol.